Twenty-six members of Congress have written to Governor Schwarzenegger and Superintendent O'Connell urging released stimulus funds to be used to SAVE JOBS and REDUCE EDUCATION CUTS, the purpose for which they were intended. It's not too late to call you Board Members and urge them to vote no on item 2 tomorrow and use more of the stimulus to preserve the gains we have all worked so hard to make. Read the letter by clicking on the link below. In the next week, you will be voting on important budget decisions that I am sure have taken their toll on your personal and professional lives. I have no doubt as to the integrity and thoroughness of your decision making process, but as leaders, I'm sure you will agree that the best decisions are made when the greatest amount of data are available to help you decide the most viable course of action. As CCSS California Teacher of the Year 2009, I wish to share the data from my school, Los Angeles Academy Middle School, located in South Central Los Angeles. As you may know, South Central schools have been hit hardest with the proposed LAUSD layoffs. If you are here, its because you are interested in making your voice heard against the devastating proposals to carry out 40% of all Reductions in Force in South L.A. schools. L.A. Academy conducted educational leafleting to parents on Friday morning, March 27th, from 6:45 am to 7:30 am. We plan to continue leafleting every Friday until further notice. Please consider doing the same at your school. Links to flyers you can download and share are posted to this blog. The UTLA House of Representatives will be voting on whether to proceed with a one day strike in May. 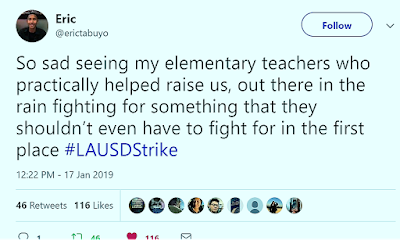 Encourage all UTLA members at your school to support this strike vote, and to participate in the strike. Call the school board, call your legislators and tell them to use more of the federal stimulus funds to avert layoffs.